Join us for an evening enjoying time with fellow Aggies on this special day for our University: Aggie Muster Day. Muster lands on Easter Sunday. We decided to keep the event on that date and will observe Muster in the evening. Westhaven Golf Club is a beautiful venue, and we look forward to seeing everyone there! Buffet meal includes a wide variety of options, including vegetarian. Alcohol will be available this year. GUEST SPEAKER: Ryan Bugai ’17, who was the Former Student Programs Coordinator at the Association of Former Students, will bring it us stories of his time working the A&M Clubs across the country… including last year’s Coast-to-Coast tour. You won’t want to miss this! EARLY BIRD TICKETS are available until 12 am on March 21st and will save you $10/ticket. Pay your dues with your ticket and save $5 on your ticket, and you will receive a new item of club swag. Item TBA. This is a ticket option on Eventbrite! Our club calendar year runs Muster – Muster, but you are welcome to pay your dues at any point in the year! Dues help pay for events, a small portion goes towards our scholarship, and you will receive discounts on some events as well as an item of club merchandise (provided at Muster for those paying dues with their Muster tickets). *Please note, no matter what point in the year you pay dues, they will expire when it is time to purchase your tickets for the next Muster. Come find us in the upstairs private party room! Grab dinner at Freebirds, drop your receipt into their fishbowl after you pay and Freebirds will donate 15% of the sales from the fishbowl total to our scholarship fund through the A&M Foundation. 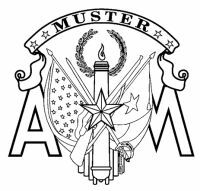 Our club calendar year runs Muster - Muster, but you are welcome to pay your dues at any point in the year! Dues help pay for events, a small portion goes towards our scholarship, and you will receive discounts on some events as well as an item of club merchandise. Current merchandise items are t-shirts and baseball caps. You may choose which item you would like to receive by emailing the club. We have both a Facebook page and group. Our Facebook group is a great place to have an open dialogue with fellow Aggies in the area. Ask questions, share news, etc. FYI: you will have to be approved to join, so definitely showing some tie to Texas A&M University gets you added faster.